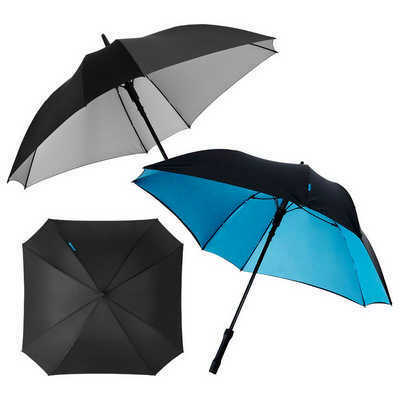 Description: Automatic opening exclusive design black and silver umbrella with fibreglass ribs and shaft, packed in a non woven Marksman gift pouch. Available in 2 colours. Features: Made from black and silver Pongee polyester material. Packaging: Polybag Colour: Black + Silver Material: Fibreglass ribs & shaft, Polyester pongee Product Size: Folded: 830mm(length) x 1010mm ? Freight details : 24 per carton, 14kgs, 19 x 86 x 29cms; Decoration Type(s): Colour Print / Full Colour Print Decoration Area: Screen: 205mm(w) x 200mm(h). Price includes : Item incl 1 panel with a 1 colour print. Setup is included.